In a growing show of force against North Korea, the United States’ Carl Vinson Strike Group is expected to arrive at South Korea’s eastern waters on April 25, in time for the communist regime’s army foundation anniversary, said Seoul officials Monday. Led by the nuclear-powered Nimitz-class aircraft carrier USS Carl Vinson, the strike group will join the South Korean Navy in a massive maritime drill designed to counter provocation from the North, which on Sunday conducted a missile test that failed. 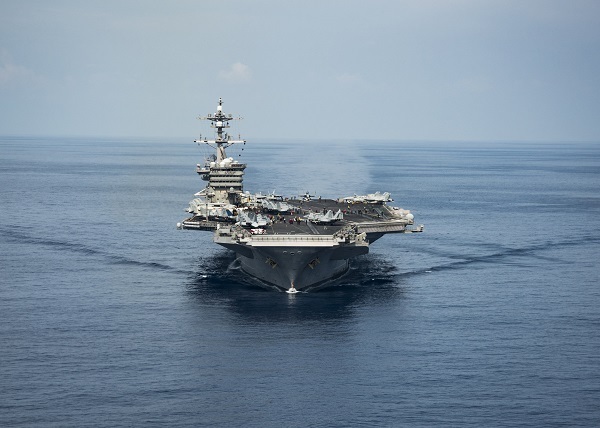 Carl Vinson is on its way to the Western Pacific after “transiting the Indian Ocean” on Saturday, according to the US Pacific Fleet Command’s Flickr account. “The US is coordinating with the South Korean government about a combined drill which the Carl Vinson Strike Group can join,” said a Seoul official on the condition of anonymity. The dispatch comes as part of increased US Navy presence in the region around the Korean Peninsula. Besides the forward-deployed Yokohama-based USS Ronald Reagan, the US has also dispatched the USS Nimitz air-craft carrier toward the Western Pacific, bringing the number of aircraft carrier groups heading to the region to three. The US announced its decision to divert the Carl Vinson Strike Group toward the Korean Peninsula on April 9, days after it launched a missile strike against a Syrian government air base of warplanes that carried out chemical attacks on civilians. The Carl Vinson Strike Group was initially thought to arrive in South Korean waters Saturday, when North Korea held a massive military parade at Pyongyang to celebrate the 105th birthday of its late founder Kim il-sung. Deployed from San Diego to the West Pacific since January, it has participated in bilateral exercises with the South Korean and Japanese militaries as well as routine patrol operation in the South China Sea.